As I flew MAD-KBP-BKK, my check in and bag drop off were made in Barajas Airport Terminal 4. Three desks were available, one for Business Class and Panorama Club Top Premimum members, and two for Economy Class. All went very smoothly, even though many people had more than one bag to drop off. Boarding was scheduled to start at 2:15 at gate S34, in Terminal 4s. Again, as the check in, boarding was done quickly and without any issues. All passengers were in the plane well before 2:55, the scheduled hour for the departure. Actual time of departure was 3:04, so 9 minutes later than scheduled. The Boeing 737-800 was well maintained, but a bit outdated. Seats were comfortable but the legroom could be a bit better. While no free meal, water was available at request at time. Fight crew was young, attentive, welcoming and with very good English. 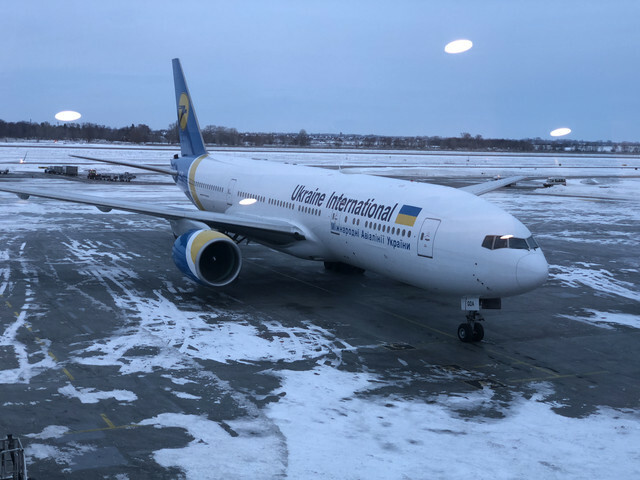 Touchdown in Kiyv Boryspil International Airport at 7:34, so 26 minutes ahead of schedule. As I had already made the check in in Madrid, I did’t have that experience in Kyiv. However used UIA’s self-chefk in terminals to check my reservation. Its also possible to print a new boarding pass and change the seat assigned to you, so no need to get in the line for the desks if you want to do one (or all) of those things. The boarding started at 19:00 (55 minutes from the STD) at gate D10. There were five boarding zones in total. The priority zone was reserved to Business Class, Panorama Club Top Premium, Families with small children, elderly people or people with special needs. 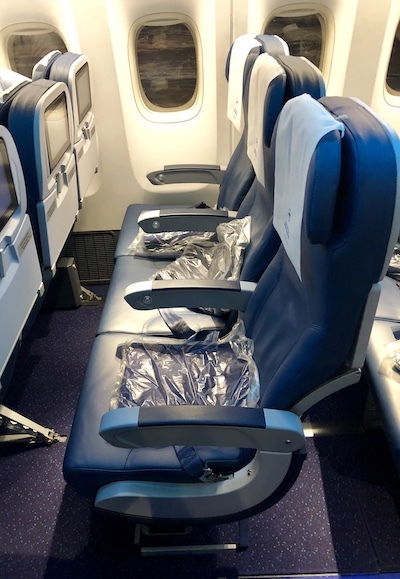 The other four zones divided the economy and premium economy passengers in smaller groups, to allow a quicker and more efficient boarding process. This way the passengers with seats located in the rear part of the aircraft (me included) boarded first, while the ones with seats located closer to the front, boarded last. UIA’s Boeing 777-200ER, felt new and smelled new. It was impeccably well maintained and the Business Class and Premium Economy seats looked very comfortable. I found the Economy Class seat to be comfortable and on par with the long-haul product from other airlines, legroom was ok but not great. All passengers were provided with a blanket (no pillow). UIA flight PS271 took off from KBP at 8:18 PM, 23 minutes after the STD. Approximately one hour later passengers were offered a complementary non-alcoholic drink and after 20 minutes, dinner was served. There was only one option for Economy Class meal, a chicken medallion with tomato sauce, pasta and broccoli. Also included in the dinner service was bread, butter, a choice of non—alcoholic beverage (alcohol was served at an extra cost), a salad, cheese and ham and a chocolate cake for desert. Although all dishes were good, I really liked the chocolate cake. 1 hour after the dinner service, all passengers were offered a bottle of water. A few minutes after that the cabin lights were dimmed and I took the opportunity to check the IFE. Each seat is equipped with a 9’’ monitor and a USB-port for powering electronic devices. There was a good availability of TV shows, movies, games and music (although not the latest releases). The flight information app was very good, with an interactive 3D-map with real-time flight information, as well as city guides. After exploring the IFE, I decided to watch a movie and after that to get some sleep. Breakfast was served 1 hour and 30 minutes before landing. Passengers were offered a choice of chicken or vegetable pie, a cold beverage and coffee or tea. Again, on par with most long haul service from other airlines. Cabin crew service trough all the flight was excellent. Always welcoming, attentive, professional and informative. UIA’s Boeing 777-200ER landed (very smoothly) in Suvarnabhumi International Airport at 10:28, 33 minutes after the ETA.